Fonna’s spectacular mountain road ends in a small parking lot by the glacier, where you find Fonna’s humble facilities – two 1970’s vintage chalet buildings. The first hut sells lift tickets ($390 krone for the day) and rents skis, boards, boots, poles, helmets – everything you need to ski if you arrived by boat. Fonna’s modest lodge serves home cooked food cafeteria style and restrooms. teh picnic tables outside are the best seat int eh house on a clear day. Fonna’s T-Bar is the only lift – intentional to withstand the ice movement on the glacier, it climbs efficiently up 800’ vertical. 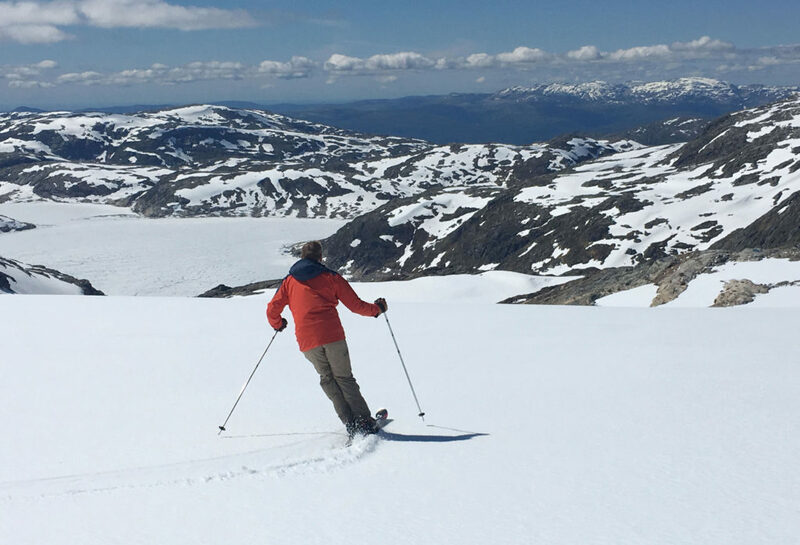 Fonna’s trails are very wide, moderatelty picthed, and well-groomed, even salted to harden the snow from melting on warm summer days.